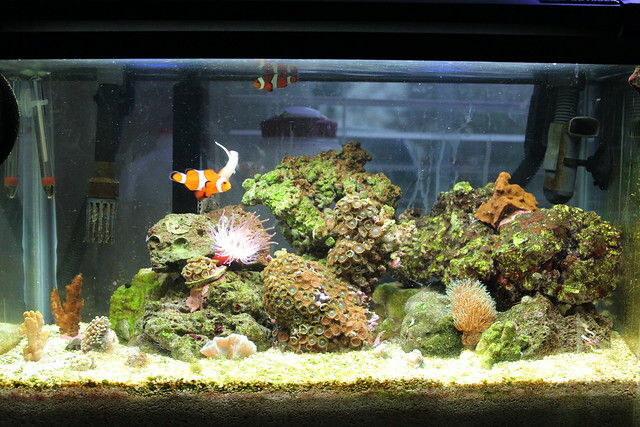 Interested in a reef aquarium, but don't want the large expense? Consider starting a nano reef! A nano aquarium is an aquarium with a water volume of 30 gallons or less. Nano aquariums are becoming increasingly common because of their small size, lower price, availability of pre-fabricated units, and unique look. However, there are greater challenges to successfully maintaining a nano aquarium than there are in a larger aquarium with a more forgiving water volume. After my share of nano reef trials, I've written a three-step guide which will help you avoid some of these "small tank" woes. I recommend starting out with one of the commercially available nano aquariums on the market. These systems come complete with the tank, hood, lighting, and filtration - all you'll need to do is add sand, live rock, water, and a heater. Simplicity is your friend with a nano aquarium! I especially recommend the Oceanic's BioCube models, which come in 8, 14, and 29 gallons. With an all in one nano aquarium, the only additional equipment you'll need to purchase is a heater! Once you've gotten the aquarium and other essential hardware, now the fun begins. Add aragonite sand (I'm not a fan of bare bottom aquariums) to a depth of .5-3" before adding freshly mixed salt water (cover the sand with a bowl to prevent it from going everywhere!). Ensure the water has a specific gravity of ~1.025, and a pH of 8.3-8.4, and a temperature of ~75-78F before adding live rock. In a nano reef aquarium, live rock combined with water movement will be all the filtration you'll need. A pound of rock per gallon of water is the general rule of thumb, though more can be used if you'd prefer. Break up laminar (stream) currents by directing them on rocks or the tank walls to produce more natural, turbulent water motion. Try to elevate the live rock, creating 'shelves' for future corals. Quality live rock is essential - do not skimp on live rock just to save a few dollars. I have found Gulf View rock to be of excellent quality and fairly priced. Stocking options for a nano aquarium are very limited, and you should plan your purchases! Small fish such as some clownfish, damsels, dottybacks, basslets, and gobies will work well, but you won't be able to keep very many. Pick one or two small fish to enjoy, but resist overstocking. If you want to keep larger fish, a nano aquarium isn't for you. Another benefit of an all-in-one tank is the built-in lighting if you're interested in keeping corals. Many species of corals also make excellent candidates for the nano aquarium, such as zoanthids, ricordia, leather corals, mushrooms, and more. Be sure to research potential tank mates to make certain you can provide a suitable home. Some of the all-in-one nano aquariums have enough lighting so that more advanced aquarists can stock 'SPS' (stony) corals, and other light demanding invertebrates. While not recommended for the beginner, success is certainly possible for a knowledgeable aquarist. At one point, I was having a lot of trouble maintaining proper water quality. I was using various additives, which would cause my water chemistry to go out of whack because of the small water volume, which would lead to more water chemistry problems, causing a never-ending cycle of problems. I finally realized something so simple it should have occurred to me sooner: stop using additives, and just stick to water changes! Weekly water changes of 50-75% are highly recommended to remove wastes and replace trace elements and calcium, especially if you plan on turning your nano aquarium into a nano reef. Just make sure your mix water is the same pH, temperature, and salinity as your tank water! This "Nano in a Nutshell" guide should get you on your way to your first successful setup, but don't neglect further reading as a tool to help you continue to achieve success with your new nano aquarium! Don't forget to stop by my blog at blog.captive-aquatics.com for more valuable information about freshwater, saltwater, and reef aquariums! If you are into reef tanks and your curiosity drove you to know more about Nano Reef tanks, read on. Let me start from the bare basics. What exactly is a nano reef tank? A nano reef is nothing but a reef tank of fewer than 20 gallons. Now, this is not a sacrosanct rule of law like Newton’s law on gravity but I strongly adhere to this definition as 20 gallons is the threshold where popularly accepted formulas for reef tanks or ‘small’ reef tanks begin to lose ground, calling for new conventions. Next, a pretty obvious question which you may ask is why would you want a nano reef tank? Pretty obvious answer: It is generally a low-cost affair. You can easily manage a decent nano tank with less than $200. Apart from cost they are easy to maintain, you can fit them anywhere, are extremely portable (that means if you are bored of watching it lying on your home desk, take it to your office desk without any hassles!). And it is not something for just novices. They can offer new challenges to experienced reef keepers minus the cost and time constraints. I say challenging because there is very little room for error when it comes to the nano tank. Whether it is maintaining water quality or temperature stability or oxygen depletion, one has to be extremely careful in maintaining a nano reef tank. Lighting a Nano reef is something of a complex issue. There are people who have kept Nano reefs with 3-7 watts per gallon of light. Some have used 30 watts. It boils down to the fact that you can have a successful coral tank using the rule of thumb, 3-7 watts per gallon, but your tank will be healthier if you provide larger quantities of light. A nano reef will require your attention towards heating and cooling aspects too. This is because in a nano reef tank stable temperature control is very important. Unlike large tanks temperature change in nano reefs can be quite large and frequent. For the heating purpose, a normal heater would suffice. But cooling is a difficult problem. A common solution is to keep the tank in an air-conditioned room. Some people use evaporative cooling with fans, but this is probably not the best idea as there are chances that amount of evaporation it causes can produce wide specific gravity shifts in a nano tank which would not be appreciated by the tank's inhabitants. Due to the small surface area, a nano reef tank will require adequate water circulation more than any other form of a reef tank. A simple and effective solution is to use an open-ended bubbler. Larger is the size of your tank more bubblers you may need. There is no doubt that a sump would greatly aid in the temperature and nutrient buffering capabilities of a nano, but it seldom used. The main reason for this is that being small in size, using a sump adds to the complexity and takes up space, a big constraint in a nano. Now here comes the best part of the nano reefs. The water quality maintenance or change is ridiculously simple! Being small, the water quantity is low. So changing the water every two weeks is a painless task. A regular water change will also obviate the need for a skimmer. Now decide on for what live rock to choose and what quantity. Again here is a nano advantage. Since the size is small you wont be required lot of rock so you can go for the best quality live rock without causing a dent in your bank account. And finally the choice for corals : You could go for both stony corals or soft corals. Virtually every soft coral is eligible for a nano reef tank. But when it comes to stony ones few points need to be cosnsidered. You should go for small colonies of stony corals, preferablly 12". You can pick any among Acropora, Bubble coral, Favites, Torch Coral or Elegance coral. For a 5 gallon nano, you should add another about 3 lbs of live rock, plus at least another 3 lbs of live sand. So go all out and play! Its not about the size, remember all good things come in small packages.